~~~~ VISIT OUR SHOP! Other characters available! ~~~~ CUSTOM Shimmer and Shine BIRTHDAY FAMILY SHIRTS ~~~ Let's Get the Party Started! It's your Birthday! 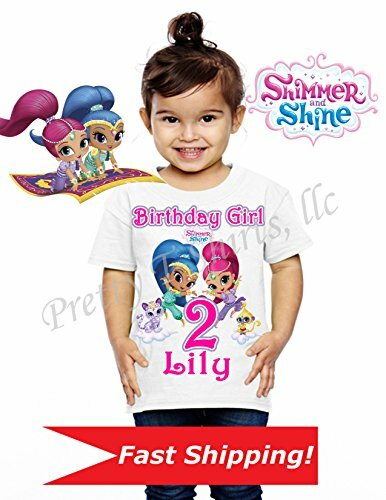 ~~~ Shimmer and Shine Birthday Family Shirts are perfect for your little kid party. These shirts will give the nice touch to your birthday party. Make one to remember forever with our Custom Shimmer and Shine Birthday Shirts. This child birthday shirts are customized with ANY name and ANY age. ~~~~~~ HAPPY BIRTHDAY PARTY!! Mickey Birthday Shirt, ADD any name & age, Birthday Boy Shirt, Disney FAMILY Matching Shirts, Mickey Mouse Shirt, OOH BOY, VISIT OUR SHOP!!! Peppa Pig Birthday Shirt, ADD any name and ANY age, Girl Birthday Shirt, Family Matching Shirts, Peppa Birthday Shirt, Peppa Shirt, Peppa Pig, Princess Peppa, VISIT OUR SHOP! !